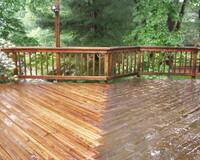 Looking for deck power washing in CT? Cleaning your deck has a good side and a bad side. The good side is that by using a pressure washer, you can rid the wood of grime and other strange substances that have made the lumber their home. The bad side is that you can do a number on your deck if you don’t know what you’re doing. If you have the wrong nozzle on the wand, get the tip too close to the wood or crank the machine up-to full-blast, you stand to destroy your deck. Don't destroy your deck! Call Blue Mobile Wash today 203-870-8168 for fast, friendly deck power washing service in CT! I need Deck Power Washing... can I get a free estimate?